Boulder Eye Care & Surgical Center | Eye Doctor Irene Olijnyk, M.D. As a comprehensive ophthalmologist who is a board certified physician and surgeon, Irene Olijnyk, M.D. has been with the Eye Care Center of Northern Colorado since 1981. 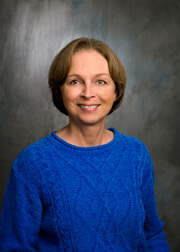 Dr. Olijnyk earned a bachelor of arts degree in psychology in 1976 from the University of Illinois. She went on to earn a medical degree from Loyola University Stritch School of Medicine in 1977, and completed an ophthalmology residency from 1977 to 1980 at Loyola University and Hines V.A. Hospital in Illinois. Some of the many areas of interest Dr. Olijnyk has include working with nearsightedness, astigmatism, pink eye, injuries, cataracts and glaucoma. She treats several causes of glaucoma and is familiar with recent advances and medications available to help treat it. As one of the most experienced eye M.D.s in the region, Dr. Olijnyk has a great relationship with her patients, and enjoys working with patients of all ages. She feels it is important for all people, from infants to the elderly, to take care of their eyes and have regular comprehensive eye exams.